The winter league is open to players of all skill levels in the western Wisconsin area! 2018 Big Buck Hunter league play begins Tuesday December 17th! Be sure to get your New League Player and League Sign Up rounds in on or before Sunday December 16th! To enter the league, play in the $20 League Sign Up tournament before Sunday, December 2nd. Play at the location where you'll primarily be playing. You must have a Big Buck Hunter online account in order to participate. If you don't have an account, visit https://www.bigbuckhd.com/user/register to set one up. Enter warden referral number 214432 when prompted during registration. New league players must play at least once in the New League Player tourney before Sunday, December 2nd in order to be eligible for league play. Each week will be set up as a different tournament, for a total of 10 different tournaments. Play the weekly league tournament ONCE Tuesday–Sunday. There will be a weekly practice round set up that you can play as often as you like. 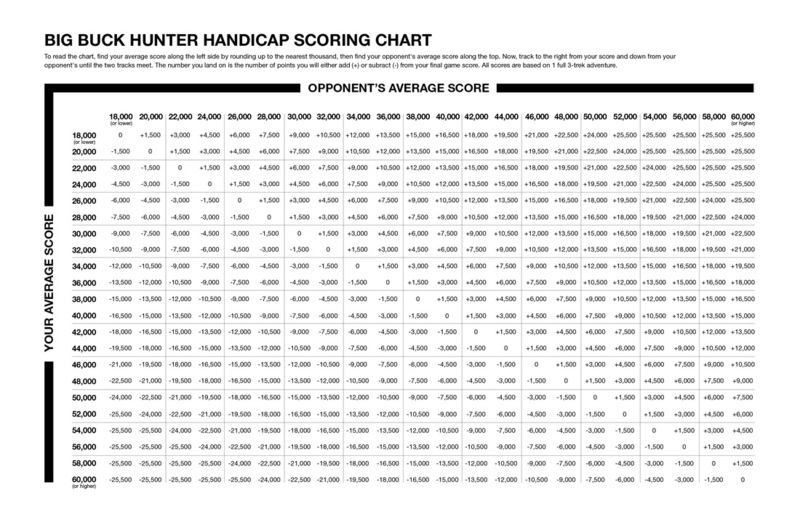 Players' scores will be handicapped according to the handicap scoring chart. 100% payout plus added BBHD cash cards and prizes. Payouts based on the number of players. Completing all 10 league tournaments will enter you in a drawing for a $50 Big Buck cash card. League end tournament will be head-to-head turn-based handicapped format.